possibility of a regulator exploding if the cylinder valve is opened rapidly. WARNING Oil or other petroleum products must never be used around oxygen regulators because these products will either cause a regulator explosion or fire. The hoses used to make the connections between the torch and the regulators must be strong, nonporous, light, and flexible enough to make torch movements easy. They must be made to withstand internal pressures that can reach as high as 100 psig. 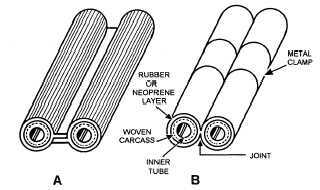 The rubber used in hose manufacture is specially treated to remove the sulfur that could cause spontaneous combustion. Welding hose is available in single- and double- hose lengths. Size is determined by the inside diameter, and the proper size to use depends on the type of work for which it is intended. Hose used for light work has a 3/1 6 or 1/4 inch inside diameter and one or two plies of fabric. For heavy-duty welding and cutting operations, use a hose with an inside diameter of 5/1 6 inch and three to five plies of fabric. Single hose is available in the standard sizes as well as 1/2-, 3/4-, and 1-inch sizes. These larger sizes are for heavy-duty heating and for use on large cutting machines. The most common type of cutting and welding hose is the twin or double hose that consists of the fuel hose and the oxygen hose joined together side by side. They are joined together by either a special rib (fig. 4-10, view A) or by clamps (fig. 4-10, view B). Because they are joined together, the hoses are less likely to become tangled and are easier to move from place. The hoses used for fuel gas and oxygen are identical in construction, but they differ in color. The oxygen hose cover is GREEN, and the fuel-gas hose cover is RED. This color coding aids in the prevention of mishaps that could lead to dangerous accidents. Figure 4-10. - Types of twin welding hose. Compressed Gas Association. Letter grades A, B, C, D, and E plus the type of gas used correspond directly with the connections on the regulators. A, B, and C are the most common size connections. A-size is for low-flow rates; B-size for medium-flow rates; and C-size is for heavy-flow rates. D and E sizes are for large cutting and heating torches. When ordering connections, you must specify the type of gas the hose will be carrying. This is because the connections will be threaded different y for different types of gas. Fuel gases use left-hand threads, while oxygen uses right-hand threads. The reason for this is to prevent the accidental hookup of a fuel gas to a life-support oxygen system or vice versa. The basic hose connection consists of a nut and gland. The nut has threads on the inside that match up with the male inlet and outlet on the torch and regulator. The gland slides inside the hose and is held in place by a ferrule that has been crimped. The nut is loose and can be turned by hand or a wrench to tighten the threaded nut onto the equipment. Another important item that is often overlooked are check valves. These inexpensive valves prevent personal injuries and save valuable equipment from flashbacks. When ordering, make sure you specify the type of gas, connection size, and thread design. The check valves should be installed between the torch connection and the hose.